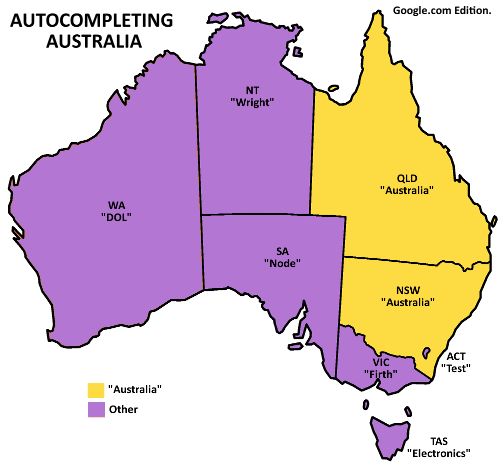 First up — the first result for VIC/NSW/WA/SA/QLD/TAS/ACT/NT. We’re not looking at the first result — we want to see the first autocomplete suggestion. This was performed logged into my google account – from an Australian IP Address. Guess what? We seem to love our State Government Departments. Sydney Dalton? Really Google? Some teenager who dissed Justin Bieber? Victorias Secret and the Darwin Awards were the big names I expected. I was a bit sad to see Melbourne Florida on the list though. 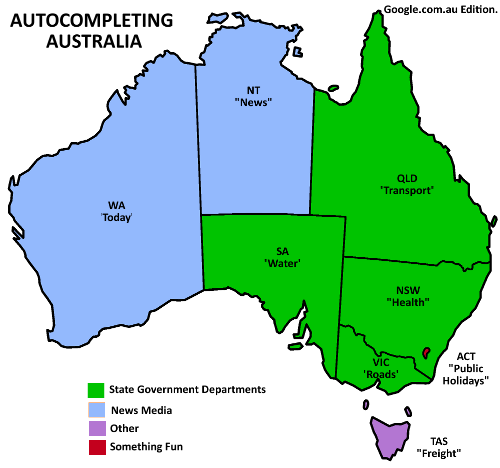 I’m so used to the Australian search – I forget that place exists. Notice anything else fun in the list? Got some more search terms to try? Anyone want to try Bing? Perth – Now. Of all the terrible new sources.